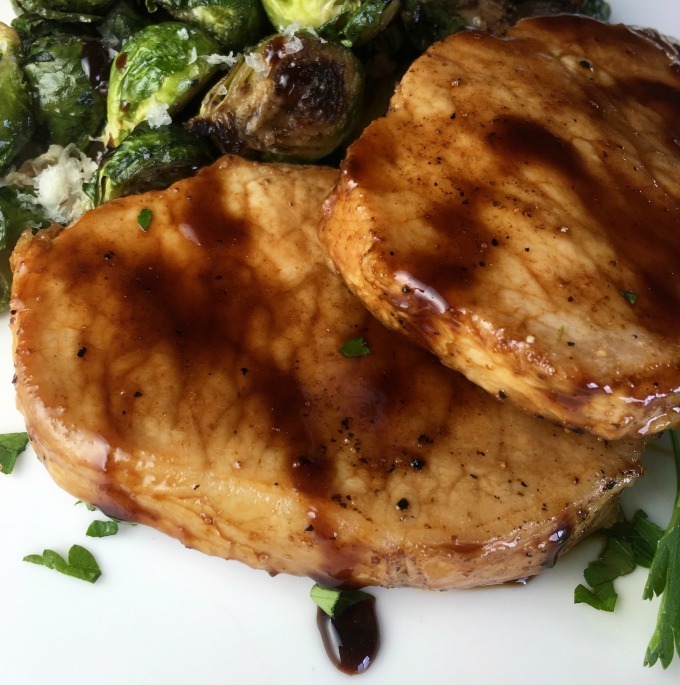 If you’re in a dinner rut, these maple balsamic pork chops may be the perfect new dish to try. They’re packed full of flavor, and take about 20 minutes to make. Yep, you heard me correctly. This pork chop recipe can go from ingredients to “dinner is ready” in 20 minutes. 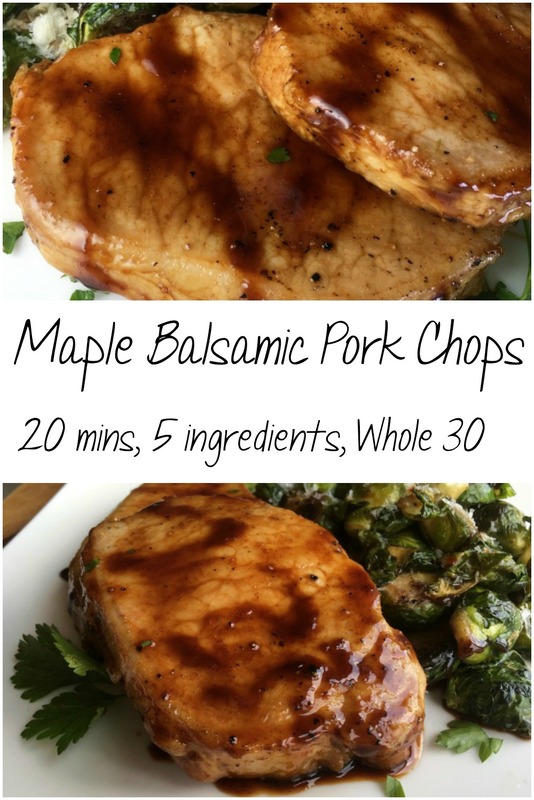 They’re so quick and easy, these Maple Balsamic Pork Chops are a great option for an after work dinner. Pair them with Pan Roasted Brussels Sprouts for a great meal. Links may be affiliate links. We’ll make a small commission if you make a purchase through them. You’re going to want a couple things that will make this pork chops recipe even better. First, is some good balsamic vinegar. You also want real, genuine maple syrup. Since these two ingredients are really the stars of the dish, it’s worth it to splurge on them. Besides, you’re not using that much of either, so you won’t break the bank. A quick pork chop recipe that packs a lot of flavor and can be on the tale in about 20 minutes. Heat olive oil in a large, heavy-duty skillet over medium-high heat. Season pork chops on each side with salt and pepper to taste, and add to the pre-heated skillet. Brown pork chops on each side, approximately 3 minutes per side. Remove pork chops from pan and set aside on a rimmed dish. Add balsamic vinegar and maple syrup to the hot skillet and bring to a boil, stirring constantly. Reduce heat to medium and cook mixture until it's reduced to about 1/3 of its original volume, and thick and syrupy. Don't overcook or the mixture will become hard and sticky. Return the pork chops to the skillet along with the juices that collected on the plate. Stir to combine juices into the syrup and cook for another 1-2 minutes. Transfer pork chops to a serving platter or individual serving plate and drizzle with pan sauce. Serve immediately with Roasted Brussels Sprouts or your choice of sides. I like to use boneless pork chops for meals like this. They cook quickly, are tender and flavorful, and they’re easy to eat. No worries about cutting around bones or anything like that. 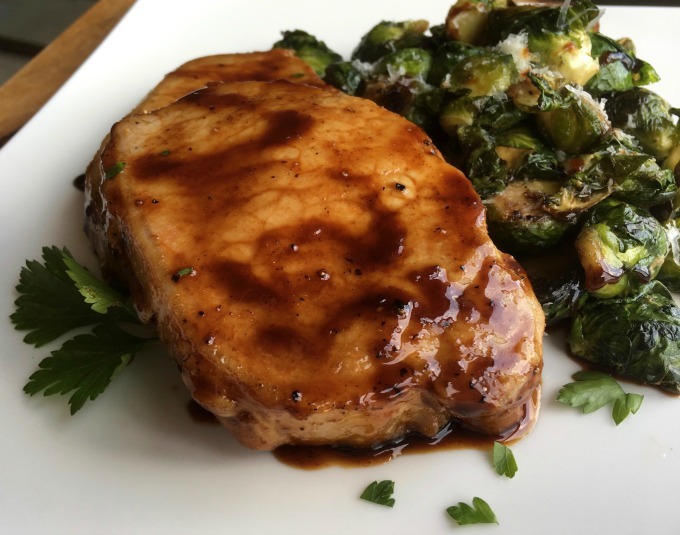 The sauce is so good, and so flavorful, that these Maple Balsamic pork chops will become a family favorite recipe. And you’ll love how quick they are to make. This pork chop recipe is one that will impress your dinner guests, too. Like this recipe? Don’t forget to share it or pin it to save for later!